Musto, Fred 1999. Recent Literature in Discovery History. Terrae Incognitae, Vol. 31, Issue. 1, p. 103. Bransfield, E. 1821a. Unpublished manuscript chart of South Shetland Islands. London: Hydrographic Office (shelf Ae1, S92). Bransfield, E. 1821b. Unpublished manuscript chart of George's Bay. London: Hydrographic Office (shelf Ae1, S90). Eights, J. 1833. Description of a new crustaceous animal found on the shores of the South Shetland Islands, with remarks on their natural history. Transactions of the Albany Institute 2 (1): 53–69. Fildes, R. 1821. Remarks made during a voyage to New South Shetland, in the log of the brig Cora, 1820–21. Unpublished document. London: Public Record Office (ADM 55/143). Gould, R.T. 1925. The first sighting of the Antarctic continent. The Geographical Journal 65 (3): 220–225. Gould, R.T. 1941. The charting of the South Shetlands, 1819–28. Mariner's Mirror 27 (3): 206–242. Hinks, A. R. 1939. On some misrepresentations of Antarctic history. The Geographical Journal 94 (4): 309–330. Hobbs, W.H. 1939. The discoveries of Antarctica within the American sector, as revealed by maps and documents. Transactions of the American Philosophical Society 31 (1): 1–71. Hurd, T. 1822. A chart of New or South Shetland. London: Hydrographic Office (shelf Gy, C74). Lewis Smith, R.I. 1987. Early nineteenth century sealer's refuges on Livingston Island, South Shetland Islands. British Antarctic Survey Bulletin 74: 49–72. Literary Gazette. 1821. New Shetland. Literary Gazette and Journal of Belle Lettres, Arts, Sciences, &c 5 (3 11): 691–692; 5 (10 November): 712–713; 5 (24 November): 746–747. Polar Record. 1946. 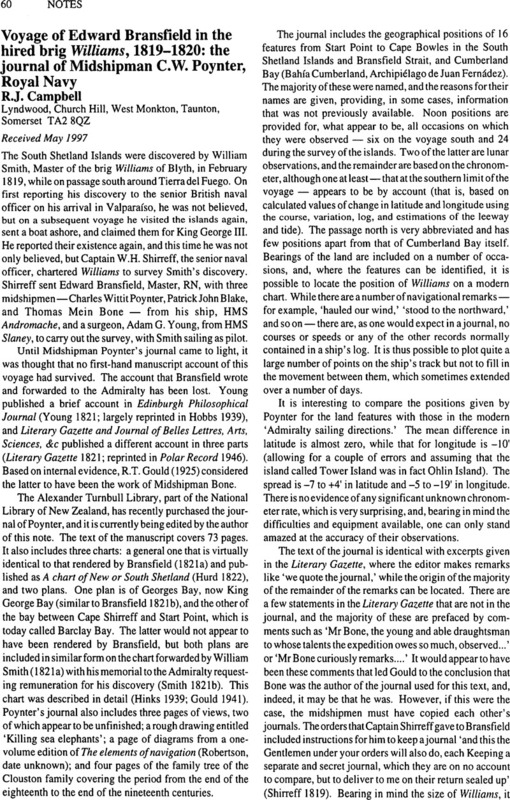 Edward Bransfield's Antarctic voyage, 1819–20, and the discovery of the Antarctic continent. Polar Record 4 (32): 385–393. Shirreff, W.H. 1819. Orders for Mr Edward Bransfield, Master of HMS Andromache dated 19th day of Decr 1819. Unpublished document. London: Public Record Office (ADM 1/2548). Smith, W. 1821a. Unpublished manuscript chart entitled ‘A chart of New South Britain discovered by Captain Smith in the Brig Williams the 19th of February 1819.’ London: Hydrographic Office (shelf Ae1, S91). Smith, W. 1821b. To the Right Honourable the Lords Commissioners of His Majesty's Admiralty, The humble memorial of William Smith, Master of the Ship Williams of Blyth. Unpublished document. London: Public Record Office (ADM 1/5029). Young, A. 1821. Notice of the voyage of Edward Barnsfield [sic], master of His Majesty's Ship Andromache, to the New South Shetland. Edinburgh Philosophical Journal 4 (8): 345–348.